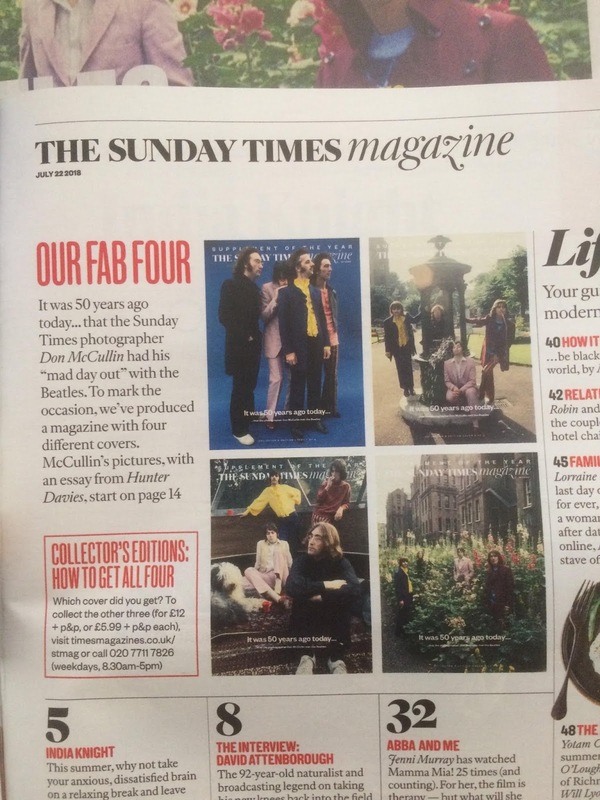 Today's Sunday Times magazine is marking the 50th Anniversary of a remarkable day in the life of the Fab Four. And, as you can see (below), they are really pushing the boat out with a quartet of collectable covers. 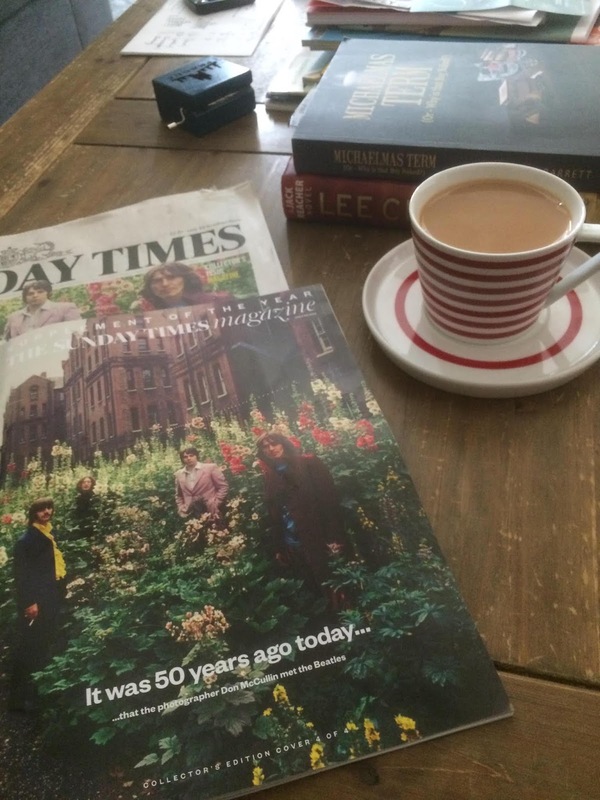 Anyone familiar with the Beatles' Mad Day Out will know that, for a handful of hours on July 28th. 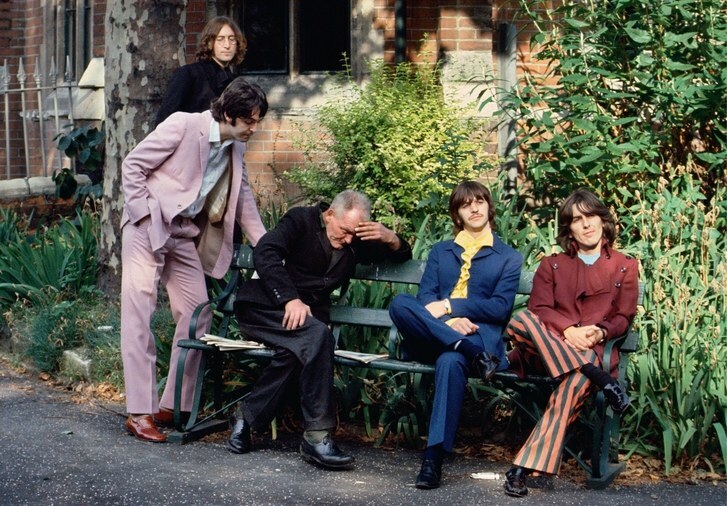 1968, John, Paul, George and Ringo took a day off recording songs for their White Album and instead, with a select bunch of toggies, slipped anchor and between them created some of the most iconic, and totally non-choreographed set of pictures ever taken of the group. Their freewheeling adventure took them to some of the most, at the time, insalubrious parts of north and east London including St. Pancras Hospital, Wapping, Cable Street in Whitechapel, Tower Bridge, even Old Street roundabout. Many of the photographs have probably appeared in this blog over the years, though this one is, I think, my personal favourite. Nice t-shirt - very niche. Your own design? 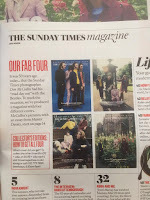 Wow, we went out for coffee this afternoon to a place that lays out the Sunday papers/supplements and of course I was drawn to the magazine with the Fab Four of the cover - A brilliant set of pictures taken in such unusual settings. I particularly liked the one amongst the hollyhocks but it wasn't on the cover of the magazine I picked up (different edition?). Paul in his mauve suit, Ringo in his yellow frilly shirt with ubiquitous cigarette in hand, George in his stripy pants and John in Black. Liked the words as well by Hunter Davies. 50 years though - scary. I've said it before Alyson, but I really could spend all day looking at photographs of the Beatles. 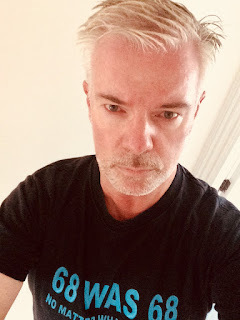 I have had a somewhat special inside connection to the Beatles through someone who lives around these parts which I think you'd like - not for here but will tell you more when we meet! Thank you C; I've had that shirt quite a while (I have pictures of me wearing it when I looked a lot younger) - and strangers will come up to me and start rabbiting away; having said that, it's not always when I wear that shirt! A *special* Beatles connection? You tease! 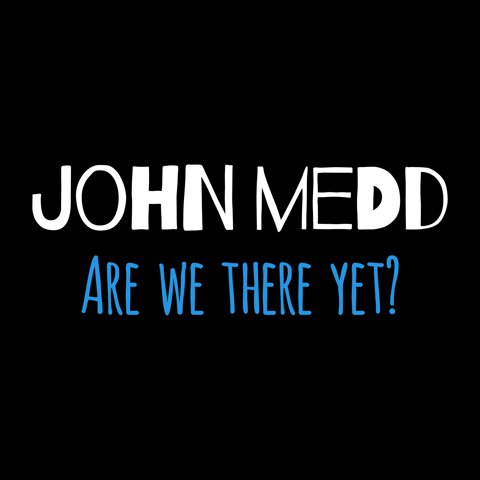 Well, if that isn't gonna kickstart our meet up plans, I don't know what will!